The main difference between women’s backpacks and men’s is that they are sized differently. This is so that a ladies backpack will fit and sit on your body quite differently from that of a man. One of the main differences between a man’s and lady’s backpack is the length of the backpack. On average, women tend to be shorter than men and as a result, have shorter torsos. This means that a man’s backpack will be towering over most women’s heads and that it will also rest way below their waists. This makes such a pack quite uncomfortable to carry around. Therefore, women’s backpacks are shorter in length. One of the consequences of this is that most women’s backpacks tend to have lower internal capacities as well. Many manufacturers create smaller internal capacities on purpose for women, however. This is because there is a disparity in the way that women and men carry weight on their body. Ladies’ shoulders also, in most instances, are a great deal narrower than that of men’s. This means that most shoulder straps are too wide, which causes them to frequently slip off. In women’s backpacks, this has been accounted for and the straps are thinner. The straps are also shorter so that they sit directly under the arms on a shorter torso. The other main modification on ladies packs is the hip belt. On women’s backpacks, this belt is a lot more curved and contoured. It has been designed to sit more closely to the body near the hips. This is important because women tend to carry the greatest amount of load near their pelvic girdle. Therefore, there needs to be a cozier fit to ensure that the weight is distributed properly. Then there are the sternum straps that sit across the chest. On men’s backpacks, this extends a little lower on the chest as men have flatter chests. With women, however, the bust needs to be taken into consideration. Since they are larger, the sternum strap needs to sit higher on the chest. Should Women Always Choose Women Specific Backpacks? For a long time, women’s backpacks were more of a marketing gimmick than anything else. As more women join the ranks of outdoor explorers, manufacturers are beginning to cater to ladies and their functional requirements. The brands that do this best of all are Osprey, Mountain Hardwear, Gregory, Kelty, and North Face. There is no denying that ladies specific backpacks are incredibly beneficial. This doesn’t necessarily mean that they are suitable for all women. Typically, this type of backpack is targeted towards a certain body height, frame, and physique. This means that ladies who are shorter and have curvier frames will benefit greatly from buying and carrying ladies backpacks. On the other hand, if you are taller than the ‘average’ woman or have a slim profile, a men’s backpack may suit you just well. The term ‘unisex’ is used quite loosely with backpacks. In most instances, it refers to the appearance of a backpack. Due to the color and the design, the backpack can just as easily belong to a man as a woman. However, unisex sizes should be a bridge between women’s and men’s sizes so that individuals with in-between measurements can find the right fit. A good unisex backpack is the Granite Gear Crown2 60. Some women are quite petite – they are small made and are usually less than 5’3 in height. It is important to remember that most ladies specific backpacks are designed to fit the average height and size of a woman. Therefore, they may be ill-fitting for the truly petite. In these instances, women can actually turn to Junior sizes. For instance, the Deuter Fox 40 is an excellent example of a backpack that can work well for smaller or shorter women. TRAIL UTILITY - Gear loops on hipbelt and attachment loops on the lid; Fastening option for material with daisy chain; Comfortable S-shaped Soft-Edge shoulder straps; Hydration system compatible; Lightweight pack totals 2 lbs. 15 oz. First things first, what are you expecting of your backpack? Women’s backpacks, too, can be categorized as daypacks, overnighters, multi-day packs, and expedition packs. The larger backpacks such as the multi-day packs and the expedition packs may be smaller than the ones that are marketed towards men. Still, you should figure out what kind of trips that you are going to take. A backpack that is meant to last you for a day or an overnight trip should be able to carry between 20 and 40 liters. The North Face Terra 40 Women’s is a great option and is available in extra small/small and medium/length. If you are looking to spend a couple of days outdoors, you should look for a pack that can carry up to 75 liters. Here, the Osprey Aura AG and the Mountain Hardwear Ozonic fit the bill well. For those that are looking for something a bit larger, Gregory Deva comes with larger internal capacities and can fit extra small, small, and medium. Size isn’t the only thing that matters, you also have to take into consideration just how durable a particular backpack is. If you are looking for a bag that is going to last you for a long time or that can endure a lot, REI is a good brand. In particular, you should opt for the REI Women’s Tech Tour and Venturi. The first thing that you should compare is the length of your torso with the length of the backpack. You should get someone to measure the length of your back from the bone at the back of your neck, all the way down to your iliac crest. This is how long your backpack should be. If you are trying on the backpack, you can do a simple test – tilt your head backwards while wearing the pack. If the pack prevents you from leaning your head back then it is too tall. As you know, your weight is carried around your hips. This is why it is important for the hip belt to be of the right size. This belt will be resting just above your hip bones. To make sure that it is a snug fit, get a backpack with a belt that can be adjusted. The suspension system is responsible for the even distribution of weight across the back, the shoulders, and the hips. As a result, it is directly correlated to both ease of movement as well as comfort. Osprey has really taken suspension systems to the next level with the Anti Gravity system. It is exceptional at ensuring that the weight is spread out evenly and that it is very comfortable, even with a load. Then there are hinge systems. This design ensures that the straps on the shoulders remain stationary despite the movement of your hips. The Gregory Deva is an excellent example of this with the Response Auto Fit Suspension. While this particular system does offer improved stability, it also results in a heavier load to carry. For increased stability, you should look for packs that sit as close against your back as possible. this is particularly important for really heavy backpacks. VENTED BACKPANEL, LUMBAR INSERT & PRECURVED COMPONENTS: Backpanel with LifeSpan foam & silicone lumbar grip. LumbarTune insert offers customizable contour for a precise fit. QuickSwap 3D precurved LifeSpan foam components precisely fit your body. FREE DAYPACK & RAINCOVER: SideKick ultra-light, removable daypack doubles as hanging reservoir sleeve. Included removable raincover stowes in its own zippered pocket. Top-loading design with front U-zip panel access. AMPLE STORAGE TO ORGANIZE YOUR TRIP: Double Barrel lid with zippered pockets on top and security pocket. SideWinder ergonomic bottle holster. WeatherShield hipbelt accessory pocket with watertight zip. Compression straps double as hipbelt for daypack. EASY ACCESS TO IMPORTANT GEAR: Dual loops and shock locks for ice tool and trekking pole attachment. Twin side-mounted zippered gear pockets. Stretch mesh water bottle pocket. External access sleeping bag compartment with removable internal divider. IDEAL USES: Backpacking, Camping, Hiking, International Travel, Adventure Travel, Trekking, Through Hiking - WEIGHT: 5 lbs. - DIMENSIONS: 28.5" x 17.0" x 13.5"
Comfort doesn’t just mean how well the backpack sits on your back, hips, and shoulders, although this is an important aspect. A good shortcut to remember is to determine how a bag carries when it is empty. This is because it can impact just how comfortable the backpack is when it is carrying a lot of stuff. While this is not applicable to all backpacks, it is a good starting point. In most instances, if a backpack is quite light when empty, it will be most comfortable when carrying a light load. Conversely, a backpack that is a little heavier without any items, will be able to afford more comfort with a greater load. The other important element is the padding on the bag. There should be adequate padding on the shoulders straps and where the hip belt meets your waist. The back also needs to be padded. A firm padding can help to increase the amount of back support. Apart from the padding, make sure that there are no un-cushioned points of contact on the bag. These can cause soreness and chafing if it continues to rub against your body for a long period of tie. While the padding on the back makes the backpack more comfortable, it can reduce comfort in other ways. This is mainly with hot it can get in this region. Remember, the heavier the pack is, the more likely it will sit on flush against your back. This can cause sweat to accumulate. This is why there should be mesh over the padding and the padding should be light and breathable. This way, more air can flow through this area, making it a lot cooler. If your will be hiking or camping in the colder months, however, you don’t necessarily have to be concerned with ventilation. If staying warm is your main goal, look for backs that have full foam padding. This will offer up greater insulation. As with any backpack, regardless if it is meant for women or men, you should look for certain features. These are detrimental to any backpack design, particularly those that are intended for longer trips or expedition. The first is compartments or pockets. These are important for two reasons. The first is organizational. The greater the number of pockets, the more you compartmentalize. This way, you will not need to empty out the entire backpack, just to find what you are looking for. External pockets are especially important. These allow you to have easy access to numerous tools or other items while you are hiking. For even greater ease, look for small pockets on your hip belts. Even with the largest backpack, there is only so much room to store items. You will find that it is quite difficult to fit larger tools inside of the bag. This is when external loops and lashes come in handy. These allow you to affix various gear to the outside of your backpack. One of the most vital things on any hiking or camping trip is water. If you prefer using water bottles, make sure that the bag has an external cloth or mesh pocket that can accommodate such a feature. There are backpacks such as the Osprey Mira AG that come with its own hydration pack. These backpacks, however, tend to be quite small and are not large enough for multi-day trips. You should also think about rain covers for your backpacks. There are some that come with a feature already attached so that it is simply a matter of pulling it over your bag. In other instances, you may have to purchase an additional one. These are the aspects that are important for choosing the right ladies backpack. Remember, the title ladies backpack alone doesn’t ensure that you will get a good fit. 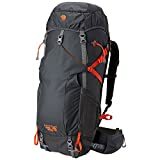 Rather, it is more about finding the backpack that is best suited to your hiking and space requirements as well as the fit to your own physique. Avoid backpacks that have only been designed for aesthetic purposes and instead look for ones that have the same features as a man’s backpack. The only real difference between these two types of packs is the way that they are sized and the various adjustable features available.